From telegraphs to television sets, new technologies have often been imagined as strange or magical in the popular consciousness. It is no coincidence that developments in 19th century science and technology like the railway, the phonograph, and the photograph coincided with a deep cultural fascination with the paranormal. Discussions of seances, spirit mediums and purported photos of ghosts were found in the newspapers of the day, and science was used to either try to prove or repudiate the claims. These feverish times are the setting for BBC One’s supernatural drama The Living and the Dead. In the opening episode, pioneering photographer Charlotte Appleby (played by Charlotte Spencer) reflects in wonder that “You could be dead and buried a hundred years, and people could still hear what you sounded like” while listening to phonograph recordings of people from the Somerset village of Shepzoy. 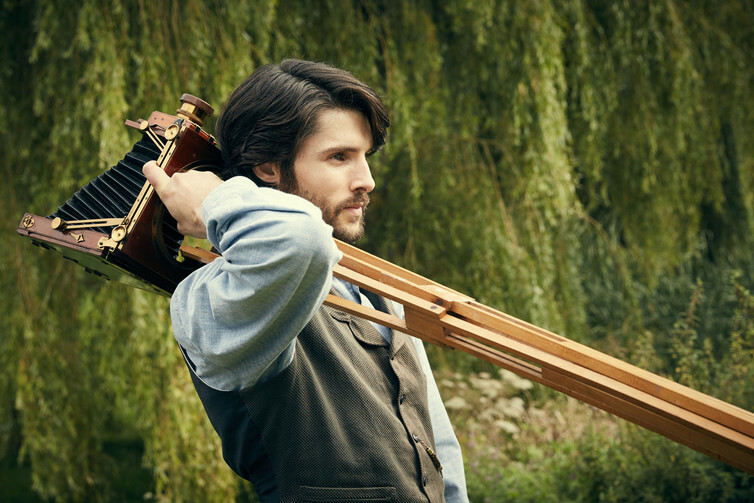 It is 1894, and she and her psychologist husband Nathan (played by Colin Morgan) have moved to the village to take charge of the family estate. Her enthusiasm for this new medium is quickly dampened, however, when the voice of Nathan’s young son who tragically drowned fills the room, urging his father to join him in play. Various other paranormal events soon follow. Ghostly voices emerging from the phonograph are replicated by a young woman who claims to have been possessed by the spirit of a local man who died without having been baptised. A railway survey unleashes the unquiet souls of five boys who died in a mine collapse. The ghosts of roundhead cavalrymen descend. And there is the curious apparition of a woman with what viewers recognise as an iPad – presumably too absorbed in her screen to notice that she has wandered into the 19th century. Series creator Ashley Pharoah described the series as “Hardy with ghosts”. In many ways, the village of Shepzoy is a new take on Thomas Hardy’s fictional county of Wessex which, modelled on the counties of England’s southwest, self-consciously captured the tensions between the city and country at the moment the transformations brought by the railways and the industrial revolution began to unfold. Charlotte distinctly resembles Bathsheba Everdene, the spirited young woman who inherits and manages her uncle’s farm in Hardy’s Far from the Madding Crowd (1874). The introduction of new machinery and farming techniques to Shepzoy is met with similar distrust and even satanic associations as they are in Tess of the D’Urbervilles (1891). But ultimately the series has more in common with the Gothic tales of the same period, such as The Turn of the Screw (1898) by American writer Henry James – in fact, the younger brother of William James, a leading early psychologist – or the short stories of In a Glass Darkly (1872) by Sheridan Le Fanu, in which self-consciously modern individuals find themselves powerless against dark supernatural forces. The tense phonograph scene from The Living and the Dead gives an indication of its writer’s engagement with these Gothic themes. And the same motif of strange objects – technological, mystical, or ambiguously situated between the two – that allow the voices of the dead to come to life is one that recurs frequently in the fictions of the time. For example, in The Japanned Box (1899) by Sir Arthur Conan Doyle a mysterious woman’s voice, thought to be a ghostly emanation, is revealed to have been produced by a phonograph. In Rudyard Kipling’s Wireless (1902), mechanical signals inadvertently channel the creative spirit and poetry of the long-dead Keats. In Florence McLandburgh’s The Automaton Ear (1873), an unnamed professor invents a device able to detect sounds beyond the limits of the human ear – only to be haunted by the now-audible cries of the dead. In each instance, the scientific instrument in question establishes a threshold between life and death, offering the simultaneously exhilarating and terrifying possibility of passing between the two. The human body and mind become peculiarly vulnerable beyond that threshold, while the stories point also to the limits of scientific knowledge at the time and its capacity to explain the world. Communications technologies such as the penny post, the railway, the telegraph, telephone and wireless radio receiver shrunk the distances between people in ways that seemed impossible. For those first witnessing them, they created a powerful sense of removal from the material world, permitting experiences that seemed beyond the realms of normal consciousness and corporeality. At the same time, new technology provided the means to preserve the past: the phonograph could capture and replay the voices of the dead, the photograph could record their lifelike image, while the then burgeoning science of psychology provided doctors with new ways to consider past versions of the self, and access to the unconscious mind. These anxieties and tensions are invoked in The Living and the Dead in a way that those of the period would have recognised, with the past, present and future drawn together through technology and the supernatural. As the web of connections between individuals in Shepzoy deepens, it becomes increasingly unclear who is being haunted, and who is the ghost. The plot device of time periods that bleed into one another is one Pharaoh has used in previous series Life on Mars and Ashes to Ashes, but perhaps here he has found more suitable material upon which to graft it – after all, the fracturing of the laws of space and time are more comfortably explored in a Victorian ghost story than in The Sweeney. Having binge-watched series one, I’m living in the hope of an apparition from the future that can confirm there will be a second.